https://semichigan.bintheredumpthatusa.com/FAQ	Bin There Dump That Southeast Michigan	https://semichigan.bintheredumpthatusa.com/img/franchisees/51.png	Contact us for more details. What is a roll-off bin, and how does it fit on my property? The hook-lift allows us to drop off dumpsters in tighter areas. Some of the dumpster delivery trucks we use to carry our containers are smaller than those used with the winch-cable system, allowing us to place containers in tighter spots and on less-sturdy surfaces. With our hook-lift dumpster system we are able to softly place containers on the ground instead of literally dropping them as roll-off trucks do. What this means is that we treat your concrete, asphalt and lawn much gentler. We offer small 6, 10, 15 and 20 cubic yard containers that are perfect for those small jobs in tight spaces. We currently offer 6, 10, 15 and 20 cubic yard dumpsters. A cubic yard is 3’x3’x3′ and weighs nearly 1 ton for sand or dirt, but much less for most construction and trash material. Detailed specs are on our website. Yes. Standard dumpster rentals have the following weight limits. Additional charges will apply if the stated weight limits are exceeded. For roofing contractors -- We offer a flat rate dumpster rental for asphalt shingle. Please call for further information. What size container should I order? If you call our office, we can help you estimate the size of the container you will need. 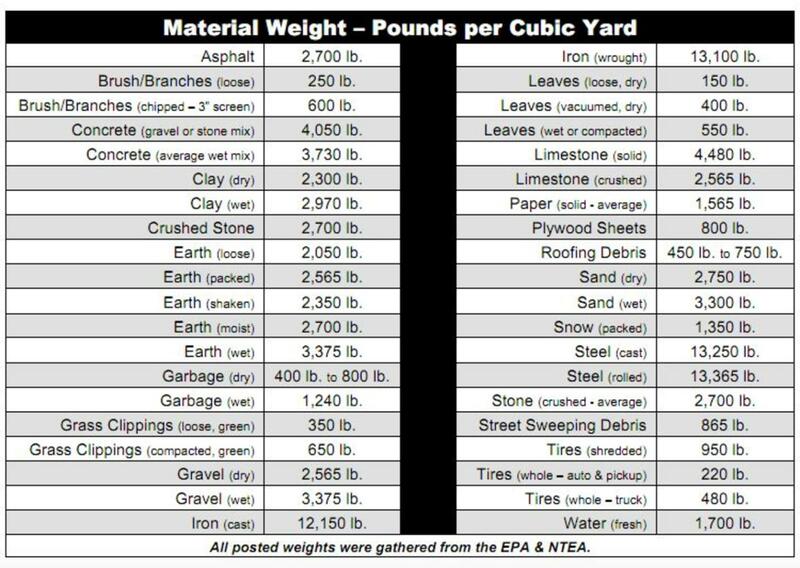 Below is a chart showing the approximate weight per cubic yard for various waste content. Please note that 1 ton is approximately 2000 lb. Any type of hazardous material cannot be accepted in the dumpster. Specifically, the following is prohibited. Can I fill the dumpster all the way to the top? You can only fill the dumpster to the top rail of the dumpster. Over filling the dumpster will cause the debris to slide off when the dumpster is loaded onto the truck. Per Michigan DOT regulations, we cover all filled dumpsters with tarp before transportation, and will not carry overloaded or overweight dumpsters. Our standard rental period is 7 days. Please call our office if you need it for shorter or longer periods. Will the container damage my property? We place a protective buffer of wooden boards under the bin, which disperses the weight. So, the bins won’t touch or scratch your driveway. The operator will do the same thing for bins placed on lawns or dirt. After you’ve put all of your trash in the bin, the operator will sweep your driveway to get rid of any unwanted materials like nails, glass shards or wood scraps. They’ll also place a tarp over the dumpster when driving away, keeping debris in and away from your property. Do I need a permit for placing my roll off container? In most cases, you will only need a permit if you are placing the container on the streets or other public property. That said, we suggest checking with your local city ordinances for any exceptions. Payment is made over credit card (we accept all credit card types). We typically pre-authorize when the order is placed, and charge the day before scheduled delivery. What Areas Of Southeast Michigan Do You Service Your Dumpster Rentals?